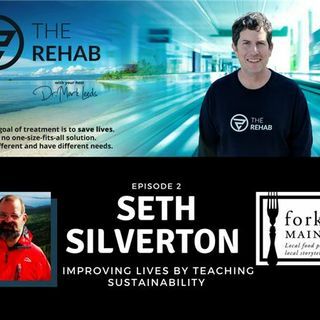 This episode of The Rehab with Dr. Mark Leeds features Seth Silverton, a master story teller and leader. He is the founder of Forktale, a story telling event paired with locally sourced foods based on a theme. He is also the founder of Village Roots, a charity which anonymously has provided organic foods to families and individuals in Maine. Seth Silverton left a successful career on Wall Street to move to a farm in Camden, Maine. In Camden, Seth discovered a need for providing healthy ... See More foods to soup kitchens, food pantries and directly to people in need of assistance. He discovered that there was a need to provide at-risk families and individuals with healthy foods to replace the refined, artificial foods that are all too common in our diets. In founding Village Roots, he was able to provide locally sourced, organic foods and make available resources to teach people to grow food for themselves. Seth Silverton is a senior level executive and business consultant with expertise in the fields of business operations, communication, team building, energy and natural resources management. Seth has a decades long history of producing outstanding bottom line results. Throughout his career he has been engaged in thought leadership that combines the power of narrative with exploitation of trends to create sustainable organizations and promote healthy, productive working groups.